No one blues a 1911 better than Colt. Plus, it's a national match gold cup government model that's extremely accurate. Nothing more beautiful than a classic design. It qualifies for CA roster exemption as a C&R handgun. I've just always wanted a Colt National Match pistol. Customer needed weapon for duty....Colt is one of the best! how many magazines does this pistol come with? You couldn't get a Better Deal. One, ( of-course ), in the Sidearm, and One Spare. - - - Bushing Wrench, Safety Lock Cable, Oil, Beautiful Case. Mine came with 2 black 8 round magazines. The traditional colt ones, they sit flush without extension that other manufacturers have. It comes with two magazines. Well built piece of American heritage. Accurate, strong, reliable. 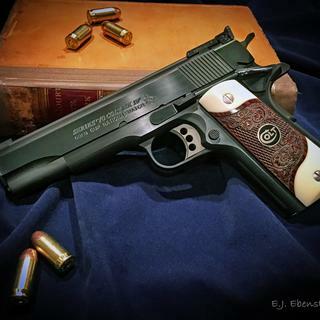 Everything you could ask for is found in a Colt. Grab-A-Gun is a trusted seller with outstanding service and products. Great weapon at an nice price point. Just like the one use in the Marine Corps, just a lot more accurate, and newer. This was my dream gun, like forever, and still is. It shoots and is acurate like a Gold Cup, with the quality of a Colt. I would only say that it is definitely only a Target gun (specifically designed for that). If it only had a skeleton hammer instead of the spur you could probably carry it in its holster and use it in other applications, including target, without the spur stabbing your love handle, hence the 4 stars. I love it and will probably keep it forever. I just received my Series 70 GCNM today. Field stripped it,cleaned it, and took a good look at all the components. OUTSTANDING! Updated sights, top rib, compact safety and slide stop, bushing and slide fit are all very well done. Colt is making a very nice product at this point in time!